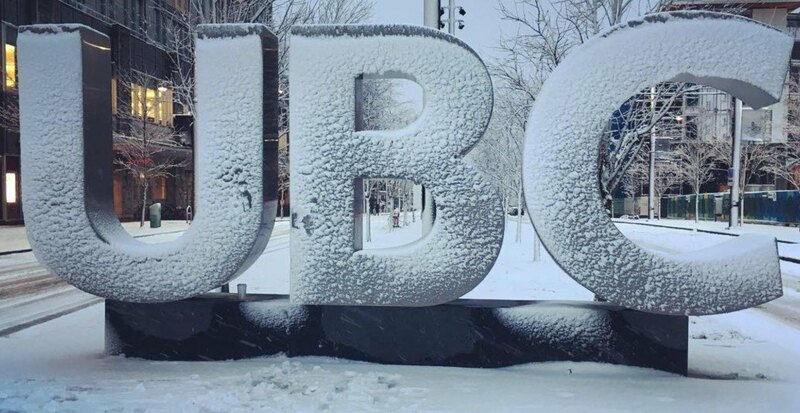 In a rare move, the University of British Columbia has cancelled most classes at its Point Grey campus on Tuesday, February 12. The decision to cancel classes starting at 8 am and ending at 6:30 pm is due to the expectation of deteriorating road and public transit conditions overnight and throughout the day due to the forecast of heavy snowfall. Up to 15 cm in accumulation is expected by the morning rush hour, with further accumulations through Tuesday night. A decision on whether Tuesday evening’s UBC Point Grey classes will proceed will be made at 12:30 pm. Non-essential services on campus will be shut down. However, classes will continue as usual at the UBC Robson Square satellite campus. A traditional mass snowball fight organized by UBC students to mark each winter season’s snowfall was originally scheduled for Tuesday, but it has now been rescheduled to noon on Wednesday. Monday evening classes at UBC Point Grey, SFU Burnaby Mountain, and SFU Surrey were cancelled. Since Sunday, the public transit system has been overwhelmed by the surge in ridership from regular drivers deciding to leave their cars at home. Poor road conditions have made it difficult for buses to navigate, and the Expo Line and Millennium Line services have been operating at lesser frequencies and capacities due to the need to manually operate all trains to ensure safe operations. According to UBC, 52% of all trips to and from the Point Grey campus are made on public transit. That is about 80,000 trips per day. SFU, Kwantlen Polytechnic University, and Douglas College administrators are scheduled to make a decision on Tuesday’s classes by approximately 6:30 am. BCIT will provide a similar update by 5:30 am, while Capilano University will issue an update by 7 am.